Ask a child what Christmas is all about, and most likely he or she will answer “presents”. Ask an adult the same question, and you’ll probably hear the word “family”. I was fortunate that during my childhood years, memories of the holiday were created that included both presents and family. Our family Christmas would be considered plentiful.My Mom told me once that there wasn’t much money around her home when she was a little girl and that she promised herself that when she had a family, she’d work all year long to save money to buy gifts. In those childhood years when I was filled with anticipation, Grandma and Grandpa Newvine would come to our house in the early hours of Christmas Eve bringing what seemed like a pick-up truck filled with gifts.I remember my brother, sister, and I wondered whether upon seeing all these gifts later in the evening, Santa might think he already visited our house and not leave us anything from him. Grandma Newvine would also knit us mittens.For a long time in the 1960s and 1970s, I could count on at least one new pair of woolen mittens every year at Christmas. They were made with love and built to last.Ironically, after getting at least fifteen pairs of mittens over my childhood years, not a single pair survived into adulthood. I have just one mitten that survived nearly forty years of moving.It’s a good thing I’m living in a climate where it’s warm most of the time. When I was older, I remember going to my other Grandma’s house not far from where we lived.Grandma’s gift to us in those later years was a box filled with all sorts of homemade cookies. She was a gifted baker and we always considered her box of cookies a true gift from the heart. 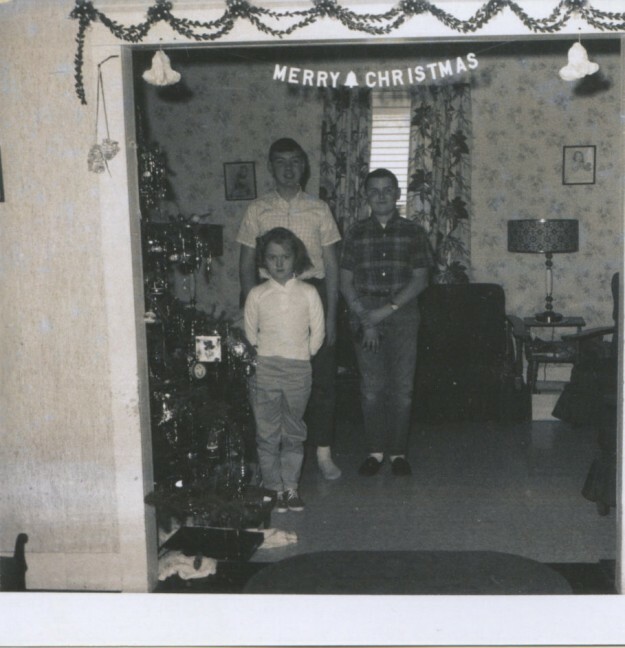 We’d go to her house which was about three miles away from where I grew up.Upon our arrival, she would turn off the television that was playing the latest Christmas TV special from Lawrence Welk or Perry Como, and then we would exchange gifts. I remember for a few years when I was in elementary school, my go-to gift for Mom and both grandmothers was a set of potholders.I had a small loom that came with an ample supply of material loops we purchased from the 5 and 10-cent store in a village near my hometown. Making potholders was easy to do, but time consuming. I bet I made over a hundred of those potholders over the years growing up in Port Leyden, New York. Mom and Dad financed most of their Christmas giving through a Christmas Club savings plan at our local bank:Lewis County Trust Company.Each week, they’d tear off the deposit ticket in the Christmas Club book and make a deposit.By December, they’d cash in the club. They even set up a smaller Christmas Club account, the proceeds of which they divided amongst my brother, sister, and me so that we’d be able to buy small gifts for everyone. I will now make a confession to my brother and sister:in 1967, I bought the Monkees album entitled Pieces,Capricorn, Aquarius, and Jones, Limited for myself using some of my share of the Christmas Club proceeds. Both siblings got gifts from me that year, but I suspect these gifts were not as elaborate as expected due to my affection for all things Mike, Mickey, Peter, and Davy. Celebrating the holiday included Mass at St. Martin’s Church in my hometown.I remember several years when Midnight Mass was part of the Christmas ritual.The nuns from the Convent in our community would lead the choir.Sometimes, I would be assigned to serve as an Altar Boy at that Mass. The priest would deliver a homily that would remind the congregation to focus on the true meaning of the holiday. How all of the parts of Christmas fit together made sense to me; being mindful of the religious foundation for the holiday, being close to family, and expressing our love for one another with a gift that we thought was just right for the person receiving it. All of it happening on one special day.